Nestled around Interstate 29, north of the Kansas City Metropolitan area is Platte County, Missouri. Named for the Platte River, this is also part of the last parcel of land to become part of the state of Missouri with the Platte Purchase of 1836. Not far from I-29 and the Smithville Lake is the small community of Camden Point. Platte County had long been a breeding ground for Southern sympathizers. Price and Jackson planned to use this area heavily as a recruiting site during the early days of the war, only to be repelled by Union efforts along the Missouri River. But that didn’t stop the locals from siding with the Confederates. One Federal report claimed “there never were more than 200 true Union men in this county.” Colonel John Calhoun Thornton began calling for volunteers into Confederate service in July 1864. Sometimes referred to as the “Paw-Paw Militia,” these men resisted the Federal call to enlist in the Enrolled Missouri Militia, or EMM. The Paw-Paw militia was composed of men who had enrolled as disloyal Union men but were armed and paid by the state to keep the peace in Clay, Platte and other northern counties. They did keep a shaky peace in the area and held back Kansas jayhawker raids. Close to 1,500 Platte Countians rallied to the Confederate side. With the efforts of Thornton, Platte County was growing ever increasingly pro-Confederate. Those that had claimed support of the Union began to drop their illusions and display their true feelings. Union General Clinton B. Frisk states “The Confederate flag has been waving over Platte City for two days, protected by men who for many months have worn our uniforms and carried under the stars and stripes the guns they now turn against us,” after Thornton seized the town with the help of the locals. The Union forces did not want to see the loss of Platte County to the Confederates, so additional troops were sent in on July 13, 1864. The men, from the 2nd Colorado Cavalry and the 15th Kansas, were a rugged group. It had been said that they were “the worst body of cut-throats and freebooters that ever tortured a victim or looted a community.” The Union men made a surprise attack on Thornton and his men at Camden Point, about ten miles north of Platte City. According to one source, the Confederates were having a picnic in an open pasture near town when the Union men arrived. They burnt the town and captured a few of the Confederates but most got away. The commander of the 2nd Colorado claimed that they killed fifteen Confederates but no citizens, “although,” he commented, “many of them need killing.” The Union men also captured a good deal of weapons and ammunition. The Battle of Camden Point basically closed the book on Confederate recruitment and presence in the northern part of the state. Only guerrilla tactics would occur after that. All of this did not stop the locals from having sympathies for the South. In 1871, a memorial to the Confederate dead in the battle was placed at the Pleasant Grove Cemetery near Camden Point. It is the third oldest Confederate memorial west of the Mississippi River. The other two are also in Missouri, at Lone Jack and in Wayne County. Many of the Union soldiers after the battle were angered about the picnic and activities given to the Confederates by the locals. They chose to punish the citizenry by looting and more while they burnt the town. There are claims that one local man was killed in the melee and Union forces gawked at the charred remains of three Confederates inside a burnt hemp warehouse. 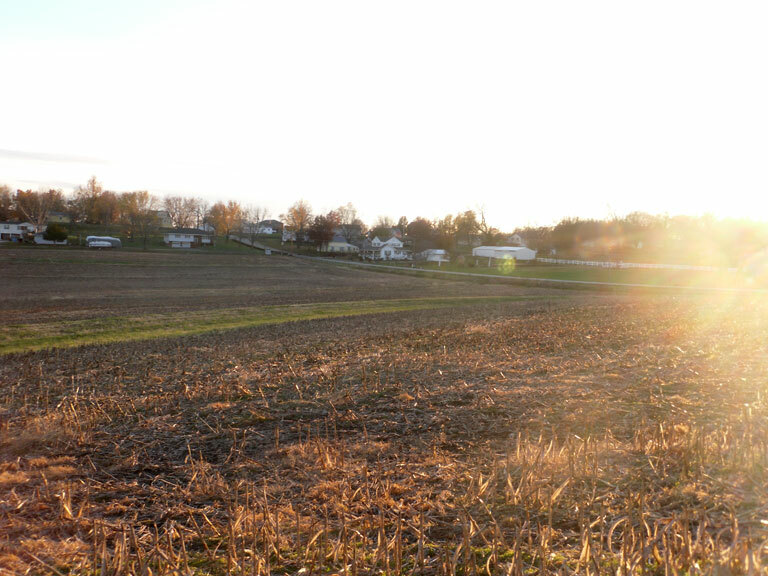 Camden Point wasn’t the only Platte County community to suffer such atrocities. The next couple of days Union forces did the same type of events in Platte City, the second time during the war that Platte City was burned. Hundreds of men of the “Paw-paw militia” were captured and put on trial for treason and awaited execution. Platte City would be captured and serve the Union on July 26, 1864. Union forces had possession of Fayette, Missouri in September of 1864. Since the Battle of Camden Point, the Confederate guerrilla presence in the state had grown. Two of the main guerrilla leaders in the state were William Quantrill and William Anderson. On September 24, 1864, Anderson and George Todd set out to attack the Federal forces at Fayette. William Quantrill was part of the group but chose not to participate. Anderson and Todd had about 250 men with them, while the Federal troops at the town numbered no more than fifty. The guerrillas purportedly were dressed in stolen Federal and militia uniforms as they rode into town, causing little alarm from anyone. Although considerably less in number, the Union men held off three charges made by the guerrillas. They were able to “hole up” inside the well-fortified court house and a railroad tie winter quarters. Both Frank and Jesse James were with Quantrill as they entered Fayette. In later discussion of the battle, Frank James would claim “It was like charging a stone wall, only this stone wall belched lead. The worst scared I ever was during the war was in the Fayette fight.” Anderson’s decision to attack Fayette was doomed to failure. The Union men were well protected and used rifles whereas the guerrillas only had hand guns. They were no match for the Federals. Anderson and Todd finally ended their efforts and left town heading north on the Glasgow Road. Quantrill and his men returned to Howard County. Thirteen guerrillas lay dead and some 30 were wounded in the aftermath of the battle. Only one Federal soldier died and about five were wounded. The defeat and the feelings felt by the guerrilla leaders would lead to the events that would occur at Centralia in just a few short days. The Missouri community of Centralia was established in 1857 in Boone County. The town’s name comes from its central location between St. Louis and Ottumwa, Iowa on the route of the North Missouri Railroad. That railroad would lead to tragic events in and around the community during the Civil War. Many of the residents of Centralia were southern sympathizers. Even the founder of Centralia, Middleton Singleton, had served in the Missouri State Guard (Confederates) during the early days of the war. One might remember that in 1860 Boone County had the third largest slave population in the state (5,034) and the second largest slaveholder population (885). That meant that 1 in 4 of all people dwelling in Boone County in 1860 were slaves. This flag on one carried by bushwackers. It was dropped somewhere in Kansas. Sterling Price was still bent on a mission to secure Missouri for the Confederacy. He began to develop his plan for this mission in August, 1864. He would use a three-pronged attack throughout the state, splitting his forces up among three secondary generals. One fourth prong that would be used for his advantage was that of the bushwhackers, guerrilla forces rampaging across the countryside keeping the Union forces and militias busy. 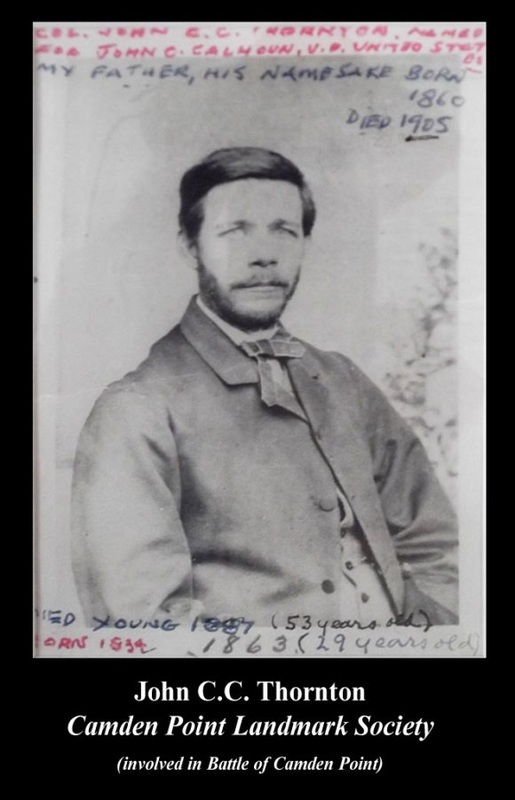 George Todd, one of Bloody Bill Anderson's right-hand men. On Friday, September 23, 1864, a group of guerrillas under George and Thomas Todd had attacked a Federal wagon train on the North Missouri line near Moberly enroute from Sturgeon to Rocheport. The guerrillas killed eleven of the soldiers and seized a large amount of ammunition. The Todd’s would carry that cache with them to an encounter with William “Bloody Bill” Anderson in northern Boone County. 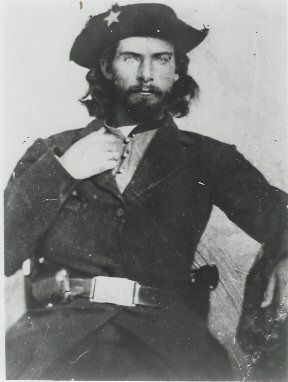 Anderson was one of the leaders of William Quantrill’s Raiders, the main force of Confederate guerrillas terrorizing the Missouri countryside. Anderson had the goal of using this ammunition to rob the North Missouri Railroad mail train as it made its route through Centralia. On Tuesday morning, September 27th, close to fifty guerrillas dressed in captured Union uniforms entered Centralia. They proceeded to harass the locals, robbing and vandalizing businesses and more. One Centralian was killed when he tried to defend a young woman. Famed Missouri Artist, George Caleb Bingham painted this portrait of his friend, James S. Rollins. That same morning, the United States Representative for Missouri’s 2nd district, James S. Rollins was traveling on a stagecoach from Columbia to Macon, Missouri. Congress was on break and Rollins was on his way to a Democratic convention in that town. Rollins had been instrumental in the birth of the University of Missouri, considered the Father of the University. He had also worked heavily in the passing of the Thirteenth Amendment to the Constitution, abolishing slavery in the United States. That is kind of ironic, considering that Rollins owned 34 slaves on his Columbia property. Rollins was traveling with the Boone County Sherriff, James Waugh. When the stage got to Centralia, the bushwackers stopped it and proceeded to rob the passengers. Rollins and Waugh provided false names when the guerrillas asked, knowing they were at risk if their true identities were discovered. As Anderson’s men went about robbing the stagecoach passengers, the sound of a train whistle could be heard nearing Centralia. The true purpose of their presence in Centralia was now coming into their hands. The guerrillas stopped their attack on the stagecoach to prepare for the train. Rollins was traveling with the Boone County Sherriff, James Waugh. When the stage got to Centralia, the bushwhackers stopped it and proceeded to rob the passengers. Rollins and Waugh provided false names when the guerrillas asked, knowing they were at risk if their true identities were discovered. As Anderson’s men went about robbing the stagecoach passengers, the sound of a train whistle could be heard nearing Centralia. The true purpose of their presence in Centralia was now coming into their hands. The guerrillas stopped their attack on the stagecoach to prepare for the train. The guerrillas were in plain sight as the train got close and the engineer could fully tell what was going on. The train’s crew fired up the coals and tried to run full speed through Centralia to prevent the impending attack. They soon realized that the guerrillas had blocked the track with a barricade of railroad ties. They had to stop. Riding that train that Tuesday morning in September were members of the 1st Regiment Iowa Volunteer Cavalry and the First Missouri Engineers. These men were on furlough, the military version of a vacation, and were heading home to northern Missouri and southern Iowa. When Anderson learned that he had Union soldiers on the train he separated them from the rest of the passengers. The train was robbed and emptied of anything that was of value to the guerrillas. Once they felt they had all they wanted, Anderson had the train set on fire and sent unmanned, full throttle westward. The blazing carriage only traveled about two miles before it came to a stop. With the captured soldiers separated from the rest of the passengers, the bushwhackers lined them up firing squad style. The men were ordered to disrobe and their uniforms piled in an area to be used by the guerrillas as disguise in another attack. One man, Sgt. Thomas Goodman was pulled from the rest to be used as trade off at some point for one of Anderson’s men who had been taken captive by Union forces. One of the passengers was German-speaking and dressed for some reason in military garb. Try as he might to persuade the guerrillas that he wasn’t part of the soldiers, they didn’t speak German. The guerrillas set up a line and fired into the defenseless soldiers, killing about half on the first shot. When it was over, twenty-two men (the soldiers and the German passenger) lay dead. The citizens of Centralia, as well as Rollins and Waugh watched in horror at the rampage that occurred. Many of the victims were shot several times and those that did not die quickly suffered a long and agonizing torture. Some of the victims were even scalped, their scalps brandished as trophies by the bushwhackers. On return to Columbia, Rollins would call for a volunteer force of citizens to become a militia to protect the city and area from the Confederates. He would name his group the “Columbia Tigers.” That name would go on in use as the mascot for the university he was so instrumental in creating. Word of the senseless killing at Centralia made its way to Union leaders in Sturgeon and Columbia soon after it happened. Major A.V.E. Johnston of the 39th Missouri Infantry was dispatched to attack the guerrillas. At least one regiment of the 39th, Company A, was from Adair County. Johnston had a force of 147 men total. Upon reaching Centralia, Johnston gathered intelligence on the whereabouts of the guerrillas. He knew that they would come for them. What Johnston did not know was that the guerrillas had basically surrounded them. When Bloody Bill and his troop charged the 39th, Johnston ordered them to fire. The Federals did, but almost before they could get another shot off they were charged by more guerrillas, led by George and Thomas Todd. It was another ambush, one of extreme proportion. Johnston got three shots off from his revolver before he was shot from his saddle with a fatal bullet to the temple. Some say that it was the younger brother of bushwhacker Frank James, Jesse, who fired the shot that killed Johnston. When the valiant fighting of the 39th was over, 123 of them were dead. 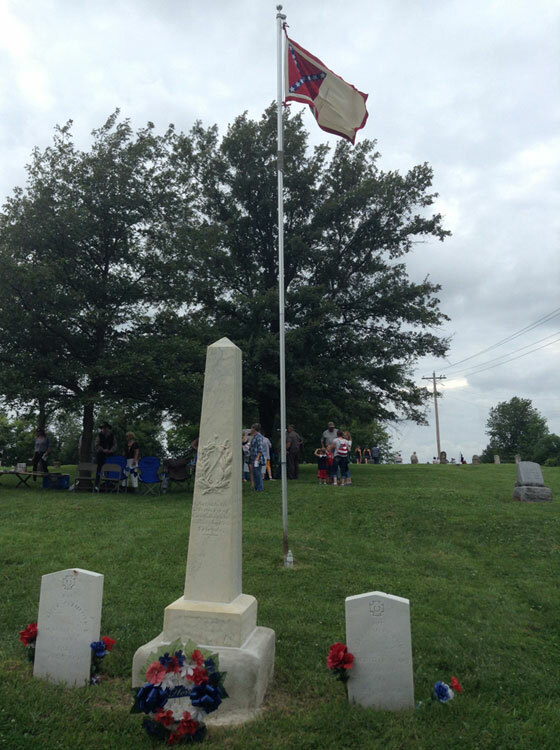 Fifty-six of the Adair County men of Company A, including their commanding officer, Captain James A. Smith, were dead. When Smith caught a guerrilla’s horse by the bridle, he said “I always spare prisoners.” The guerrilla replied fiercely, “I never do,” and shot Smith dead. Some say that eight Union men were scalped, including Major Johnston who had a small piece of his scalp taken. Scalping was one of the least atrocious acts committed on the victims. Men were repeatedly beaten and dead bodies shot again. One Union soldier was pinned to the ground with his own bayonet. Another reportedly had been mutilated, portion of his anatomy cut off and shoved into his dead mouth. The 39th Missouri Infantry was, for the most part, a crew of green recruits. They did not have the weapons of the mounts necessary to take on the well-equipped guerrillas. Where the bushwhackers rode some of the best horses of the state, the 39th rode exhausted, beaten-down nags, old farm mounts and mules. The bushwackers all carried several revolvers allowing them swiftness, while the 39th carried Enfield muzzleloading rifles, unable to quickly fire a rapid response. Some of these men didn’t even get off the first shot, as their weapons were found fully loaded on the battlefield. The monument above is in honor of the soldiers massacred by Anderson's guerrillas in Centralia on September 27, 1864. 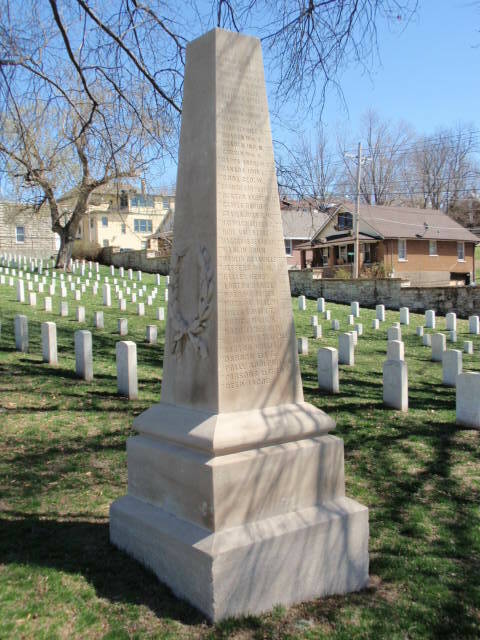 It is located in Jefferson City National Cemetery where most of the men are buried. More than fifty Adair County men died in this horrific event. Capt. J.A. Smith, Sgt. W.G. Elliott, Sgt. J.S. Nesbit, Sgt. M.B. Long, Sgt. J.C. Reynolds, Corp. A.W. Walters, Corp. Jasper May, Corp. Canada Keller, Corp. Elijah Eitel. 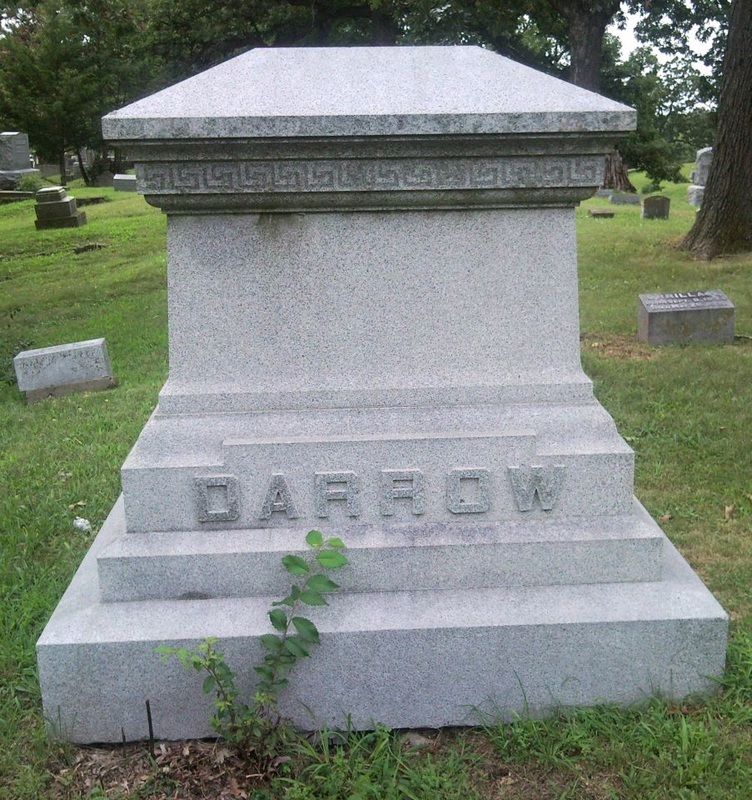 The marker above located in Forest-Llewellen Cemetery at Kirksville is the final resting place of Edwin Darrow, one of the survivors of the Centralia Massacre. 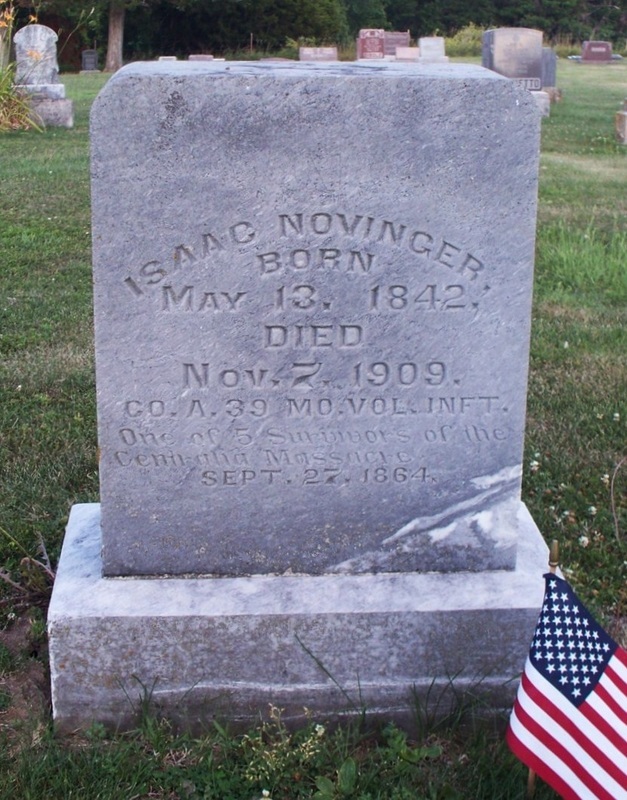 ​This tombstone for Isaac Novinger is located in the Novinger Cemetery. Novinger was one of the survivors of the Centralia Massacre. In retrospect, the events at Centralia, Missouri on September 27, 1864 were heinous by any shape of the word. One thinks of the Sand Creek Massacre in Colorado a few short days afterward, Wounded Knee, the Nanking Massacre, and My Lai during the Vietnam War, and Rwanda. You might say that there was two Centralia Massacres on that September day. William Anderson perpetrated one of the events of a long list of atrocities of history, and it all happened in a small Missouri town. 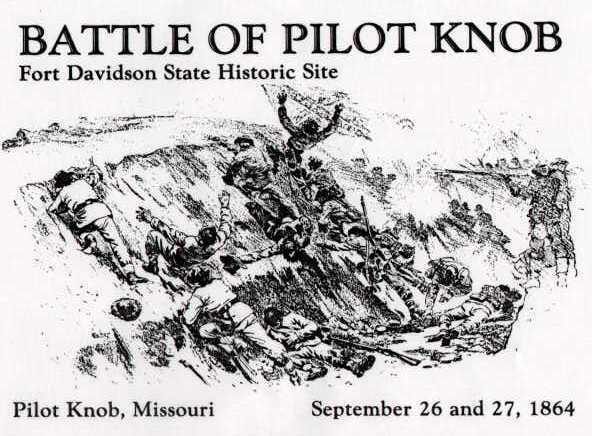 The Battle of Pilot Knob, Missouri is also known as the Battle of Fort Davidson. While Bloody Bill Anderson was pillaging and murdering in Centralia, Price was advancing in his own right in the southeastern part of the state. Confederate General E. Kirby Smith ordered Price into Missouri with hopes of capturing a major civilian/military location. Price wanted to take Ironton, a railroad hub, and fulfill his mission of seizing St. Louis for the Confederacy. Much of the Mississippi River area lay in the hands of the Union, thanks to men like General Ulysses S. Grant and battles at Cape Girardeau and Fort Donelson. The capture of St. Louis could be a major boost in the arm for the Confederacy with all of the military advantages located there. Price’s underlings, Generals Jo Shelby and John Marmaduke pleaded with their leader to move quickly on the hometown of Laclede and Chouteau. 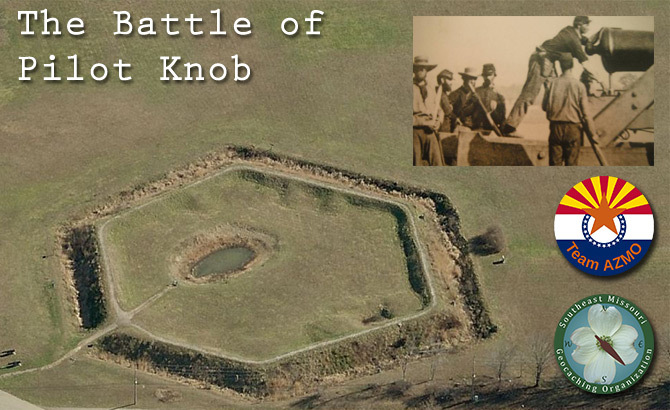 Price chose to attack Fort Davidson instead, located about ninety miles southwest of St. Louis at Pilot Knob. His opponents felt this wasn’t the best, with reasoning laying in that the fort was manned by a small force of infantry, not well-trained militants experienced in fort warfare. Price had cavalry at his disposal and felt that they could outmaneuver the infantry men. He believed that he could take the fort quickly with little casualties; causing grief for the Union defends and boost the morale of the Confederates. Major General Sterling Price entered Missouri, his old homestate, from Arkansas on September 19, 1864. He sat upon his horse Bucephalus, named for the horse of Alexander the Great. The three branches of his force were under the command of Shelby, Marmaduke, and Fagan. General James Fagan was an Arkansas politician and not a military man by training. Marmaduke was a career military officer, trained at West Point. Shelby was a brilliant and tough cavalry officer, coming up through the ranks of the volunteer militia and well respected in Missouri. Shelby brought more than 3,000 deserters at gun point with him when he rejoined Price inside the Missouri border. Fagan and Marmaduke were both quite undermanned. About a fourth of Price’s total force was without arms when they first entered Missouri. Many were dressed in tattered rags and were barefoot. This hodgepodge of miscreants was going to go up against well-supplied regular army. 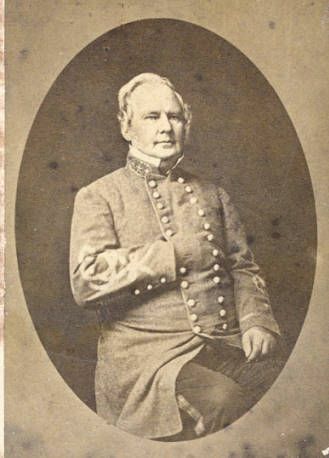 With this Confederate force advancing into Missouri, the Union commander of the Department of Missouri, General William Rosecrans was concerned. He had heard that Price was coming and that he had a major force. Rosecrans had only 6,000 men to protect St. Louis against Price’s 12,000. Rosecrans also was aware that Fort Davidson was his only fortification in south central Missouri. He decided that it must be held and dispatched General Thomas Ewing and the 14th Iowa Infantry from St. Louis to Pilot Knob by train. Ewing arrived at the fort on September 26, 1864. Fort Davidson was an interesting structure of military force. It was hexagon in shape and contained enough arms to supply Price’s unarmed segment of men. Fort Davidson has been referred to as the “Thermopylae of the West” by one historian. Thermopylae was a mountain pass in Greece that had been furiously held by Spartan Leonidas in 480 B.C. Outnumbered, the Spartans would lose but they put up a good fight. While Bloody Bill Anderson and his guerrillas were interrogating Congressman Rollins at Centralia, Price arrived just outside of Pilot Knob. Tension existed between “Ol Pap” and one of his generals, Marmaduke, leading to Marmaduke’s replacement with General John B. Clark Jr. With that change in command achieved, Price ordered Fagan north to attack the Federals at Pilot Knob. Shelby had already been ordered to destroy the St. Louis and Iron Mountain Railroad at Irondale. In many ways, Fort Davidson was considered a “death trap” if it was attacked by any artillery force. There were no shell-proof shelters and it was surrounded on three sides by hills. Surrender would have to happen quickly if it was every attacked in such a manner. Many of the men set to protect Fort Davidson were inexperienced in warfare and one of their commanders, Thomas C. Fletcher, was more concerned with politics than warfare. Fletcher would be elected Missouri’s 18th governor later that year. General Ewing had the ultimate responsibility for Fort Davidson. He strategized with his officers and set the plan of defense. He also had orders to evacuate if the main Confederate force moved against them. Ewing didn’t feel that was a possibility, as he believed that Price was indeed on his way to St. Louis. What Ewing didn’t know was that 9,000 of Price’s men were marching down on him from the east and that Shelby had cut his line of retreat to the north. Lacking that vital information, Ewing thought they were safe. During the afternoon of September 26, Ewing sent two infantry companies out toward Fredericktown. They would run smack-dab into Fagan’s army. Fagan’s men would force the Federals back into Ironton and brisk fighting would take place in that small community. Reinforcements came to the aid of the Federals and they would be able to surprise Fagan and cause his troops to retreat. Late afternoon rain would disadvantage the Union troops and cause them to move back into Ironton once again. After dark other Union scouts would discover the main force of Price’s troops and send word back to Ewing of the impending danger. At some point during the evening of September 27th, Ewing realized that his route of escape had been cut off and feverishly set about preparing the fort for defense. He also quietly set his men about to abandon the fort and sneak out under the cover of darkness. They packed up what they could and set a charge to their powder magazine that would go off long after they had left. The enormous explosion failed to cause Price to have his men check out the fort until daybreak. The 28th found Price being called to take after the retreating Federals, but he refused. Instead he ordered his men west toward Jefferson City. His goal of St. Louis was finished and he chose his second option. The former governor didn’t know that he wouldn’t return to the capital city either. As the month of October began Jefferson City was under the military command of Major General Alfred Pleasonton. Knowing that Major General Sterling Price had given up on St. Louis following the Battle of Fort Davidson and was set on returning the Jefferson City, Pleasanton organized a defense of the capital city. There were 6,000 Union troops to protect Jefferson City as of October 5, 1864. On September 30, 1864, Sterling Price marched westward along the southern bank of the Missouri, destroying railroad bridges and track along his way. October 5, 1864: The rebel forces under General Price have made a further advance westward…about fifteen miles below Jefferson City. Large Federal forces about St. Louis and below intend to drive him towards Kansas. 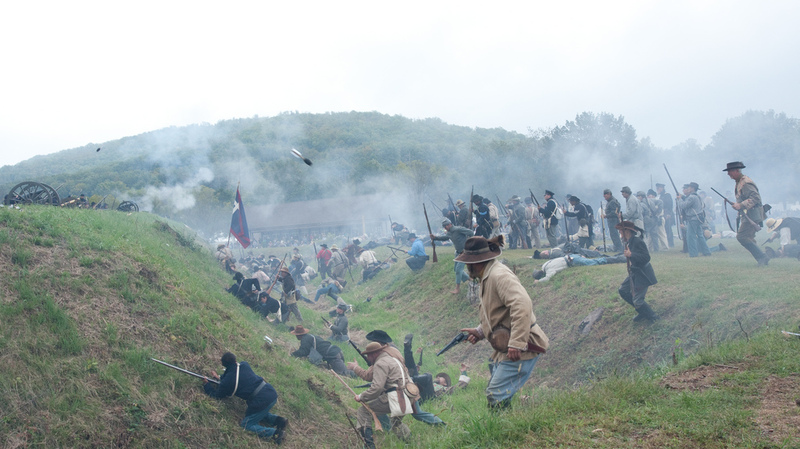 Part of Price’s force began fighting near Jefferson City on the evening of October 8, 1864, as reported by Brig. Gen. Clinton B. Fisk. Rebels had cut the telegraph lines between Sedalia and Lexington and Bloody Bill Anderson had been instrumental in the Lexington event. Union officers, especially Major Samuel S. Curtis, had commandeered steamboats on the Missouri for transport of troops to resist Price’s army. General Jo Shelby and his men engaged in a skirmish about five miles from Jefferson City on the Osage River. Shelby’s men were successful and cleared the river for Price to pass. Marmaduke had burned a bridge over the Gasconade on October 4th, and seized a large ammo train on the Pacific Railroad. It would appear that the Confederates were making their path as they wished. That entirely wasn’t the case, as Pleasonton had fortified the capital city with over 7,000 men in attempts to prevent Price from entering. Price realized that any approach toward Jefferson City was futile and proceeded west toward Kansas City. The man for which Jefferson City was named once said “I hold it that a little rebellion now and then is a good thing, and as necessary in the political world as storms in the physical.” Some may scratch their head in wonder that this integral location would be the site of very little rebellion during these days of the Civil War. Since taking Jefferson City wasn’t in the cards for Sterling Price and his band of Confederates, they would continue up river towards Boonville. Boonville had been site to three previous engagements during the war and it looked like it would be again. Shelby had attacked California, Missouri on October 9th, leaving “Missouri’s Swamp Fox,” Brig. Gen. M. Jeff Thompson to control the town. Shelby moved on toward Boonville in preparations for the arrival of his commanding officer, Sterling Price. This area around the Missouri River is known as “Little Dixie” and was home to the largest portion of slave possession in the state. The land was full of Southern sympathizers, but there were also pro-Union people in the area. Boonville was covered for the Union by the 52nd Enrolled Missouri Militia, commanded by Captain Horace Shumaker. These volunteers frequently clashed with the likes of William T. Anderson and his guerrillas. At the time that Jo Shelby was entering Boonville in October, 1864, Shumaker’s men were of little consequence to the Confederate General. When he learned that there were Southern men impressed into service in the 52nd’s ranks, Shelby reserved his display of gunplay. Unfortunate for one man, Captain Shumaker, Shelby did not hold good on his claim completely. Shelby goes on in his writing to mention the justified execution of the militia’s leader. Shumaker had earlier engaged in hanging of a suspected spy for Bloody Bill Anderson. Some claim that it was Anderson and a relative of the man who took Shumaker out and killed him then got rid of his body in the Missouri River. On October 10, 1864, Price entered Boonville, quite probably to fanfare. The former governor is said to have given a speech to the crowd to encourage Confederate support and recruitment. Price himself wrote: “At Boonville. All the people turned out to greet us.” Price gained about 2,000 recruits at Boonville, though many were unarmed and untrained. Price took time to feel like the returning hero, but not too much time. He knew that the Federals were on his trail. He set about positioning his men in preparation for the attack. Price placed the troops of Fagan and Jackman along the main roads into Boonville and they met the Union forces as they came near the town. The Confederates must have received a morale boost from the welcome they received and were able to drive the Union troops led by Brig. Gen. John Sanborn back and chase them about twenty miles from Boonville. While the actual battle only brought the deaths of four Confederates and one Federal, this excursion at Boonville would have lasting effects on Price’s Raid through Missouri. Bloody Bill Anderson and his men came into Boonville on October 11th. They were in the traditional revelry, parading around with the scalps they had taken at Centralia. General Price was none too happy with the guerrillas and refused to speak with the bushwhacker until they had removed the scalps from their saddles. Once Anderson consented to the order of the superior officer, Price ordered him north to break up the North Missouri River. Anderson’s men had already accomplished much of that task and greatly hindered any rail travel in the area, so they took to their normal habits of looting and killing in the small towns along the river. George Todd’s men were ordered to be scouts for Price for the rest of the raid. The two days spent there would provide increased time for the Union efforts to be reinforced through the rest of the state and into Kansas. This jaunt of “Ol’ Pap” would soon come to an end. Glasgow, Missouri is located in Howard County along the Missouri River. The sympathies in the town were nearly equally balanced during the Civil War. One might recall that Howard County was the second largest slave populated county in the state in 1860. The pro-Confederate population served their cause with splendor, Glasgow served as a recruitment and training area for the Confederates early in the war. That led to the Union taking control of the town and maintaining it until the entrance of General Sterling Price’s men in October 1864. While Price led his men westward across Missouri, he sent a detachment to Glasgow to liberate weapons and supplies claimed to be there. This combined mounted infantry, cavalry, and artillery force laid siege to the town and the fortifications on Hereford Hill. Before dawn on October 15, Confederate artillery opened on the town and advanced on Glasgow, forcing the Yankees to fall back. Union forces retreated out of town toward the fortifications on Hereford Hill. They formed a defensive line in this area, but the Confederates continued to advance. Convinced he could not defend against another Confederate attack, Col. Chester Harding Jr. surrendered around 1:30 pm. Price’s men found rifle-muskets, overcoats, and horses and remained in town for three days before rejoining the main column with new supplies and weapons and marching on towards Kansas City. The victory and capture of supplies and weapons were a boost to Price’s army’s morale. The struggle wasn’t over once the Confederate soldiers left Glasgow. Bloody Bill Anderson made his journey into town as did William Clarke Quantrill, both within the week. Quantrill came first on October 17th, kidnapping the town banker and forcing him to hand over the contents of the bank’s safe. Anderson arrived on October 21st to humiliate and torture a wealthy resident who was an avid Union man and had placed a bounty on the bushwacker’s head. The man, Benjamin W. Lewis was such a staunch Union man that he was invited to dine with Lincoln and had dinner with the president on the night John Wilkes Booth ended his life. Lewis was not far from the grave himself. 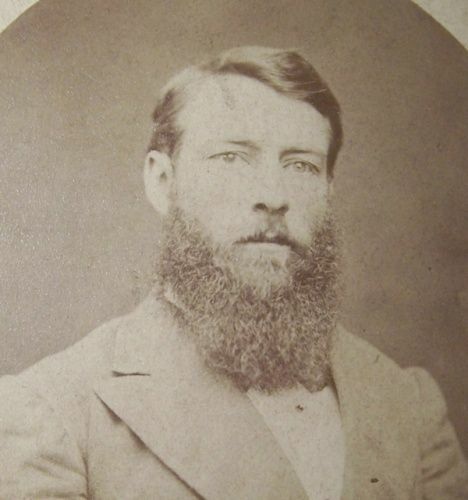 Because of the injuries inflicted on him by William Anderson, Lewis would die in 1866 at the age of 54. Following the siege on Glasgow, Price’s troops continued west along the Missouri River until they arrived at Lexington on October 19th. Once again, we find a Missouri community with strong Southern sympathies. Lexington served as a hotbed for Quantrill’s Raiders during the war. Many of them would use this town as a headquarters for the trips through the state. You might recall that Lexington was the site of an earlier military engagement involving Price, commonly referred to as the “Battle of the Hemp Bales.” That September 1861 battle had been considered a victory for Price and the Confederacy. On October 19, 1864, Price and his men came upon the town. What they did not know was that Union reinforcements from Kansas had now joined the fight. Under the command of Major General James G. Blunt, the Union soldiers encountered Shelby and his men at about 2:00pm. The Federals were forced back through the town and withdrew toward the Little Blue River. With the regrouping opportunity at the river, Blunt was able to build a strong defense and use the newfound knowledge of the size and disposition of Price’s army to take on the rebels forthwith. With the victory at Lexington, Price is edging closer to his destination of Kansas City. On October 21, 1864, his men are less than ten miles from Independence. The Little Blue River runs through Jackson County at this point and Major General James G. Blunt has established his position on the western bank of the water. The Union forces under Blunt had been repelled at Lexington by Price’s men under Jo Shelby two days earlier. Blunt had every intention to delay the Confederates longer to allow Major Alfred Pleasonton to catch up from Jefferson City and attack Price from the rear. Blunt and his 2,000 men were part of a Kansas Union force recently entering the state. 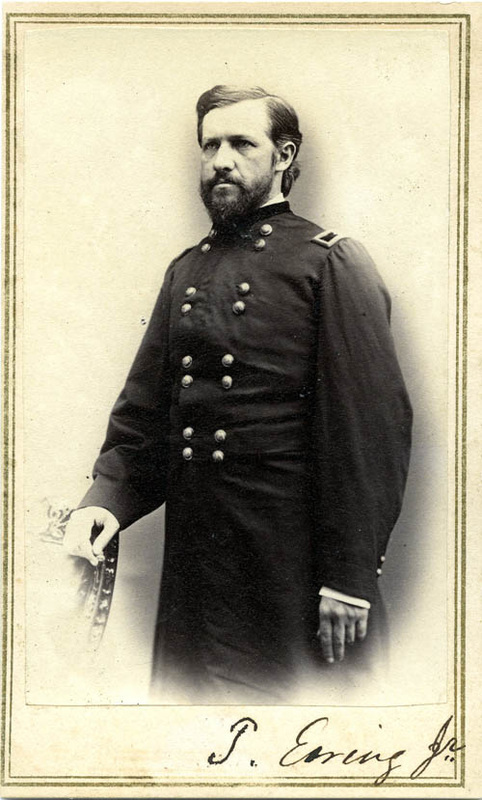 His commanding officer, Major General Samuel R. Curtis remained in Kansas City with more men. This force of Kansans apparently refused to enter Missouri, tender over the border struggles between the two states. Late during the morning of October 20th, Colonel Thomas Moonlight made his first movement after crossing the Little Blue. Curtis gave Blunt permission to engage the Confederates and they quickly set up their position with men all the way from Independence. Curtis also ordered Blunt to Independence, taking most of the men with him. The superior officer had finally gotten the Kansas militia with him to advance, but they would only go as far as the Big Blue River. It was here that Curtis had Blunt regroup so that they entire force could build their strength. Moonlight would be left with a small force of about 400 men. Price’s force numbered between 12,000 and 15,000 men. Curtis ordered Blunt to take all of the soldiers back to the Little Blue the next day. Blunt learned that Moonlight had followed orders and burned the bridge across the river, engaged the rebels and retreated across the river. It was now Blunt’s turn to engage the enemy and try to force them back beyond the defensive position that the Union troops had earlier. Blunt ran straight into the thick of the Confederate force and pushed it back toward the Little Blue. More Confederates arrived, causing Blunt to fall back again. By late afternoon, Blunt and the Federals had withdrawn to Independence. The battle was a tactical victory for the Confederates, but they lost valuable men, equipment, and time. It actually turned out to be a strategic defeat. Pleasonton would soon be on their heels. 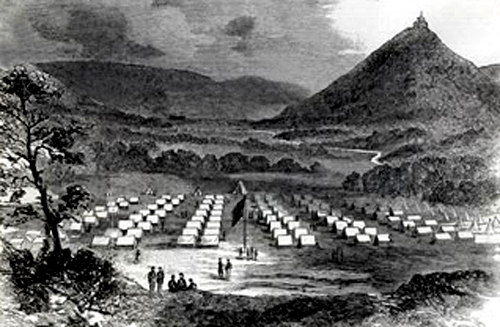 Sterling Price camped at Independence on the evening of October 21, 1864. His men had repelled the Union forces under Major General James Blunt twice and they had a string of victories under the belt. They may have been feeling confident that they were going to successful. The next morning he had Brig. Gen. Jo Shelby leading the march westward. Marmaduke and Fagan’s men were right behind them. The marauding bushwacker George Todd, who was serving as a scout for Price did fall victim to Union lead, though. Pleasonton had finally arrived on early on the morning of October 22nd. The new Union men were savage in their handling of the Confederates under Fagan and pushed the men back through the city toward the main Union force. Pleasonton would be initially successful at claiming Independence but ultimately be pushed back on the morning of the 23rd. Price had to have grave concerns over the way that Pleasonton’s men fought and the amount of lives lost on the Confederate side. Most of the battles along the way to this place had been considerably minor. Now he was fighting a very capable foe in the forces of Curtis and Pleasonton. The Union forces would regroup at Westport. Price would continue toward Kansas City after the victory at Independence. He had a good number of wagons with him hauling men and munitions and was concerned about crossing the Big Blue River. He had to find a suitable ford, a shallow place to cross the river. Byram’s Ford had long been a well-known and decent crossing point for travelers seeking to cross the river. Both sides knew this and both wanted possession of Byram’s Ford. Union Maj. Gen. Blunt had control of the west bank of the river and intended to defend it. 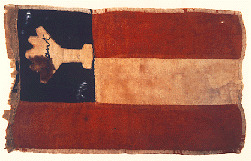 Confederate Brig. Gen. Jo Shelby would attack Blunt’s forces and cause them to fall back to Westport. Price would be able to cross the river and enter the town of Little Santa Fe. When Marmaduke’s men tried to cross the river at Byram’s Ford and hold the crossing, Pleasonton attacked them. Pleasonton would take control of the ford around 11:00am on October 23, 1864. Gen. John McNeil, who had led Union forces in the Battle of Kirksville, was also leading forces against the rebels. What remained of Marmaduke’s force would regroup with Shelby and create one force. These Confederates would be attacked by Blunt in what would come to be known as the Battle of Westport . The last three battles have all been in succession, occurring in close proximity and time. The Battle of Westport would be one more in this group of battles between Price and the Union forces in Missouri. With the loss of Byram’s Ford, Price moved toward the south. Price found himself at a disadvantage in the number of his force at Westport. Curtis had close to 15,000 men and Pleasonton had more than 5,500. At this time, Price’s force numbered only somewhere between 8,000 and 10,000. Quite of few of them were not trained military, but the poor equipped bushwackers who had joined him along the way. It was his hope that the experienced men of his force could make up for these ill-trained men. Price decided that he would take on Curtis’ men of the Army of the Border first; the larger of the two Union forces, and then capture the very needed supplies at Fort Leavenworth. His men could then turn on Pleasonton’s Provisional Cavalry after obtaining those resources. The key was to prevent Curtis and Pleasonton from joining into one force. Speed would be crucial in Price’s endeavor. On October 23rd, Price attacked Curtis along Brush Creek. Shelby and Fagan led the charge at Brush Creek. They were successful at first, but that success soon fizzled. Price just didn’t have enough men and resources to continue the drive. A local farmer showed Curtis a creek bed that allowed the Federals to get behind the Confederates late in the morning. This led to Shelby’s men being pushed south. Pleasonton continued to attack Marmaduke at Byram’s Ford. The two Union forces would push in the Confederates and force them back and into a drastic retreat to the southwest. Unfortunate for the Federals, they were too exhausted to work well together and reluctant to continue the fight. It was the valiant actions of Jo Shelby that gave the Confederates a chance to escape across the Big Blue River to Little Santa Fe. There the survivors reunited with their large wagon train. Victory was not possible, but these men had lived to fight another day. That would be the results of this battle, as the Union forces furiously chased the rebels and engaged in several minor battles afterward. They would chase Price into Kansas where he would lose a substantial number of his men and two of his general to capture at the Battle of Mine Creek, including Brig. Gen. John Marmaduke. The remaining rebels would escape through Oklahoma (then Indian Territory), into Texas and finally back to Arkansas. Only about half of Price’s original force would make it back to Arkansas. More than 1,500 were killed, wounded, or missing from each side after the Battle of Westport. The engagement is known as the largest battle of the Civil War west of the Mississippi River and often called the “Gettysburg of the West.” The Battle of Westport was more instrumental than Gettysburg, though. Robert E. Lee’s Army of Northern Virginia retreated still as an intact army while Price’s Army of Missouri was now a thing of the past. It also effectively brought an end to the bushwacker rampage in Missouri with many of the remaining guerrillas following Price into Arkansas. The war in Missouri was drawing to a close. Price would return to the Missouri side of the border in his retreat back to Arkansas. Near Deerfield in Vernon County, the Confederates would encounter the pursuing Federals on October 25, 1864. Douglass Ford on the Marmaton River was the only place that wagons could cross the river. Here Price had Shelby to slow their pursuers. Shelby had about 8,000 men and was the only full division remaining for Price. McNeil was following with two infantry companies. Shelby had many unarmed men in his ranks but McNeil was unable to see that. The fighting raged for two hours before the exhausted Federals couldn’t fight any more. They had to let them go. There would be one final conflict between Price and the Union forces that brought his defeat. That battle would take place at Newtonia, Missouri. Price was almost into Arkansas when his men had one more encounter with the Union forces. In Newton County, they stopped to rest near Newtonia on October 28, 1864. Maj. Gen. James G. Blunt surprised them and began to force them out. Shelby saw the Federals and sent his men out to engage them. Shelby had a larger force than Blunt and pushed the Federals back to town and nearly flanked them. Without the help of late reinforcements, Shelby may have defeated the Union troops. But the increased Union force caused Price and the remainder of his forces to retreat into Indian Territory. The war for Price, and for all practical purposed the State of Missouri, was finished.